Rachel’s first cookery show The Little Paris Kitchen was aired on BBC2 in 2012, and received great critical acclaim. She also writes a column for The Evening Standard Supplement ES Magazine, sharing her delicious recipes with Londoners every week. Rahcel has recently wrapped up filming on two series for BBCWW. Rachel’s fourth book Little French Kitchen was released in 2103. Rachel’s unconventional food background has helped formulate her unique culinary touch. She graduated with a Bachelors degree in Art & Design from the renowned Central Saint Martins College of Art and Design in London. Thereafter she worked for a luxury fashion brand, doing PR and e-marketing. Ultimately, her passion for pâtisserie lured her to Paris, where she studied at Le Cordon Bleu and obtained a pastry degree. She put her skills to excellent use at the delightful Paris culinary bookstore and tea salon, La Cocotte. There Rachel concocted delicious sweet treats: she regularly provided catering for culinary book launches and hosted her own cookery classes on site. Following the success of her edible endeavours at La Cocotte, she now works on culinary projects throughout the world. Her role as an international food creative has spanned six-course dinners and workshops in places as far-flung as London, Paris, Berlin, Milan, Melbourne, Sydney and Buenos Aires. She is also a food writer with books “Barres à céréales, Granola et Muesli faites maison” and “Pâtes à tartiner” published by Marabout. Her third cookbook (her first English book) The Little Paris Kitchen was published by Penguin in March 2012. The Little Paris Kitchen was number one bestseller for three weeks and in the top five for ten weeks in the UK. As of March 2013 it has sold 150,000 copies. It’s now been translated into Dutch, French, Italian, German, Danish, Russian and Norwegian, Polish and Russian. The book launched in the USA in 2013 to rave reviews. It is also due to launch in Brazil, Latvia and Taiwan in 2013. The accompanying TV series, The Little Paris Kitchen, has now been licesned by BBC Worldwide to the following countries: USA, Australia, Belgium, Canada (both French and English speaking channels), Iceland, New Zealand, Poland, Africa and Hong Kong. Rachel’s new TV show for BBCWW, ‘ Rachel Khoo’s Kitchen Notebook: London’ and ‘Rachel Khoo’s Kitchen Notebook: Cosmopolitan Cook’ is currently airing in various overseas territories. 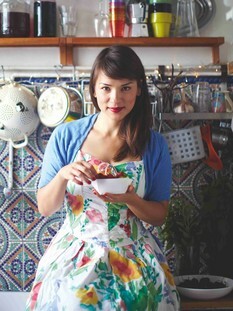 Rachel’s fifth book “Rachel Khoo’s Kitchen Notebook”, which will feature all the recipes from the show, will be published by Michael Joseph in February 2015. It is available to pre-order from Amazon now. She regularly writes a recipe column for the London Evening Standard and as of July 2014, has a column in the Daily Mail’s Weekend magazine – as well as working on illustrations for her books.